Buses, Planes, and Automobiles… and some sun, too! 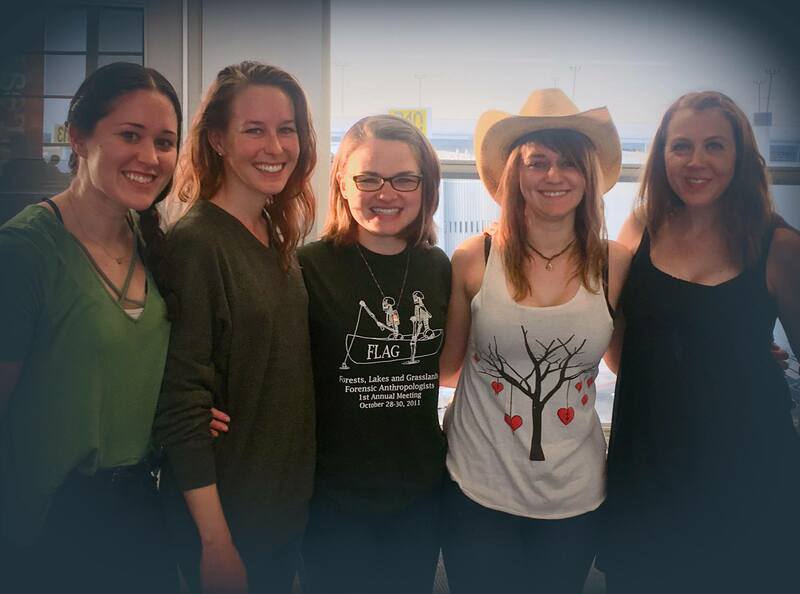 We gathered at the American Airlines counter at the Indianapolis International Airport this morning at ~6am excited for our trip to the Texas Borderlands! I am not a light packer so I arrived at the airport with some anxiety that my suitcase would be over 50 lbs. I walked into the airport and saw Erica, Angela, and Rachel standing there with their suitcases looking much less full than mine! Just another indication that I need to work on my packing skills. Anyway, my suitcase ended up only being 33 lbs, which I was pleasantly surprised by and very relieved! Our group ready for our trip to Texas! We quickly checked our bags, went through security at a relatively rapid pace, and then headed to the coffee shop to fuel ourselves for our full day of travel. We had two flights, one from Indy to the Dallas Fort-Worth airport and a second from DFW to San Antonio. Both flights went extremely smoothly with no delays. That was certainly welcome! After arriving in San Antonio, we headed to the rental car place. We got our van and played a quick game of Jenga trying to fit our full suitcases in the back of the van. After we were loaded up, we went to lunch at Moses Roses in San Antonio, just down the street from the Alamo, which was our next stop. Moses Roses was delicious! Several of us ordered some type of Brisket, and everyone seemed to enjoy their meals. After lunch, we walked around the Alamo. It is a beautiful place with so many cacti and palm trees. Of course we had to stop to take some pictures with the awesome plants along the way! A quick picture in front of a beautiful Prickly Pear Cactus! After walking around the Alamo, we walked through part of the River Walk. We saw lots of tour boats, which had beautiful designs on them. The River Walk has many beautiful waterfalls as well, and lots of palm trees and cacti! It was a beautiful day on the river! 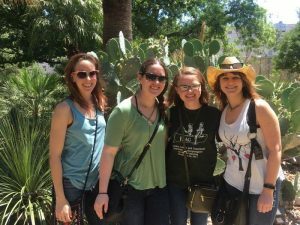 The Alamo and River Walk allowed us some time in the sun and heat and after the River Walk, we were all ready for a cool drink. We headed to our van to make the ~3hr drive to Falfurrias, Texas and made a stop along the way for some water and a bathroom break. 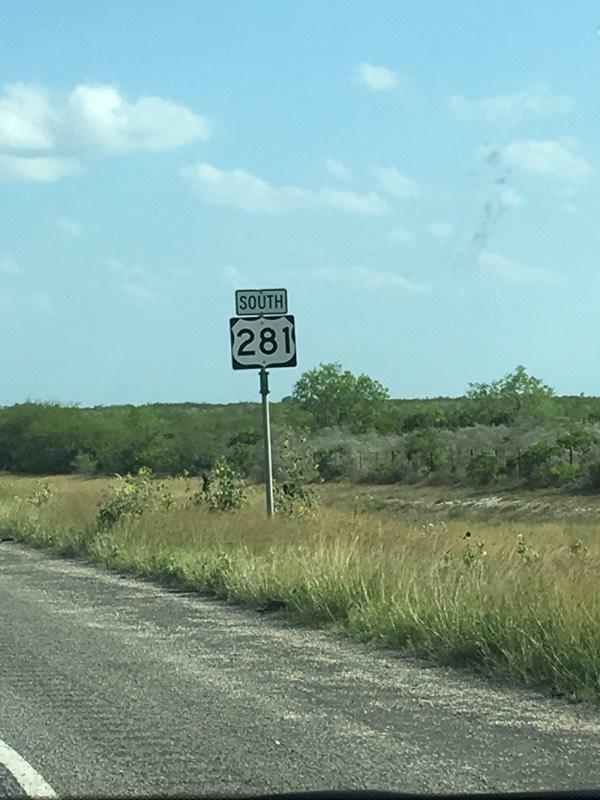 It was so neat to drive along Highway 281, which runs all the way from Canada to Brownsville, TX, which is just a shot away from the Mexico border. The drive went very smoothly and the scenery was beautiful along the way! It was a beautiful drive down Hwy 281. We arrived at our hotel at about 6:30pm and unpacked the van. We then took a quick trip to HEB to gather items needed for our lunches for the next couple of days. I love HEB and so I definitely enjoyed our shopping trip. After HEB, we grabbed some delicious tacos from the gas station next to our hotel. I have heard about these gas station tacos from Leann, Erica, and Jessica before and was very excited to try them! They lived up to all my expectations and were definitely delicious! 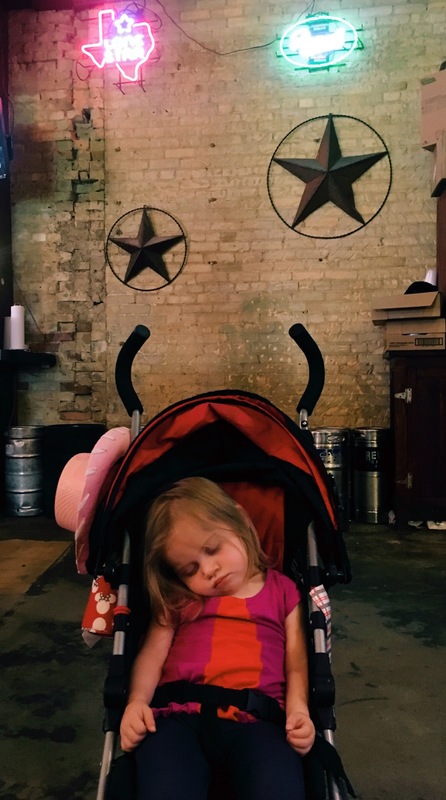 After a full day of travel, I think we all feel like Eleanor! 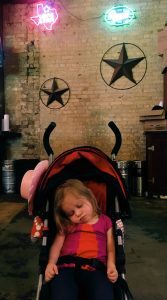 Sweet Eleanor, asleep in her stroller! Tomorrow marks the first day of our work here in Falfurrias, Texas and I think it is safe to say we are all so excited for the work to begin! I am terrified of snakes and scorpions. And spiders for that matter. In fact, I am terrified of most insects and reptiles. I remember watching the movie “Holes” when I was little and vowing to never travel anywhere that has scorpions. Dr. Latham sent the Beyond Borders team an email a few weeks ago with a link to “leg protection” for the field. I clicked on the link and it took me to a website to buy snake guards. I naively thought that we were just purchasing leg protection to protect against ticks and the harsh shrubbery of the Texas ranchlands. When I read the description for the leg protection, it mentioned that they would protect against rattlesnake bites. That’s when I became slightly worried. When I saw Dr. Latham in the hallway a few hours later, I asked her if there are rattlesnakes in Texas. Yes. And then she mentioned that the leg protection would also be to protect against scorpions. I momentarily panicked as my fears of both rattlesnakes and scorpions surfaced. This trip to South Texas is so much greater than my fears of rattlesnakes and scorpions though. There are many things that I am afraid of. I have no trouble admitting that. But one of my greatest fears is never seeing my family again. They are, in part, what defines me. They have seen me through good times and bad. They are always there for me whenever I need them. I cannot imagine the fear and horror that would go through me if one of them disappeared. I am so excited to take part in building 10 water stations for migrants who put their lives at risk to cross through Texas and make a better life for their families. I am also excited to take part in foot searches for missing migrants. 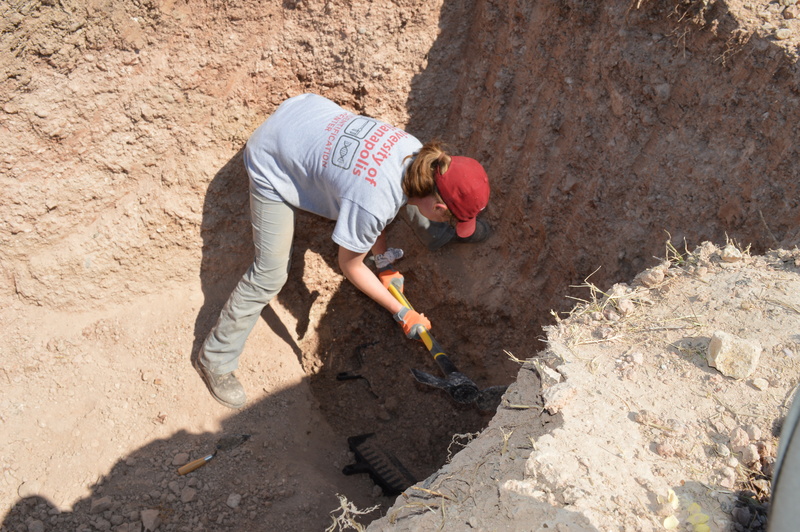 In May of 2017, I had the incredible opportunity to travel to Rio Grande City, Texas with the Beyond Borders team to recover the remains of migrants in the county cemetery. It was an amazing experience and I learned so much about myself, my team, the migrant crisis occurring in South Texas, and South Texas in general. It was an experience that I will never forget. I am so excited to have the opportunity to travel to Brooks County, Texas this May to take part in this humanitarian mission once again. I think it will be a totally new experience because it is a different county and a different reason for going on this trip than the one I went on in May of 2017. I am excited to see and experience the county where Beyond Borders began their work in May, 2013. I think it will be an incredible experience but also a heart wrenching one. I think it will help me overcome some of my fears and will truly change me as an individual. In the Human Biology graduate program at UIndy, we carry the motto “Expect the unexpected.” We go into each case with a little bit of information and a tiny bit of a plan that is almost always adapted once we arrive on scene. Going into this trip, I feel like I have a general idea of what to expect: hot, humid (+10000%). I know what Texas looks like and feels like. I know what I need to pack and what I don’t need to pack. And I know that when I return home, I will be exhausted but bursting at the seams with sadness, empathy, a feeling of accomplishment, and happiness. Happiness because I get to take part in this incredible mission. However, I also know that I need to expect the unexpected because while we are going to Texas with a plan, we may be faced with obstacles along the way. I have been home from Texas for approximately a week. 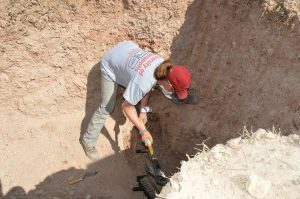 In the first three nights, I found myself waking up partially from a restless sleep thinking I was still in Texas digging in the field with my team. The first night I woke halfway, sat up in my bed and thought I was waiting my turn to mattock. While I truly do love mattocking, at 2am, I could hardly keep my eyes open while I was “waiting my turn.” The second night I woke halfway and I again thought I was waiting my turn to dig. The third night I again awoke thinking that we were digging and this time it was as if there was a pit between me and Erica and I had to get out of the bed and across the pit to help dig. Each night I have found myself barely able to keep my eyes open and in my stupor, I feel badly because I feel like I am letting my team down as a result of not being able to keep my eyes open. 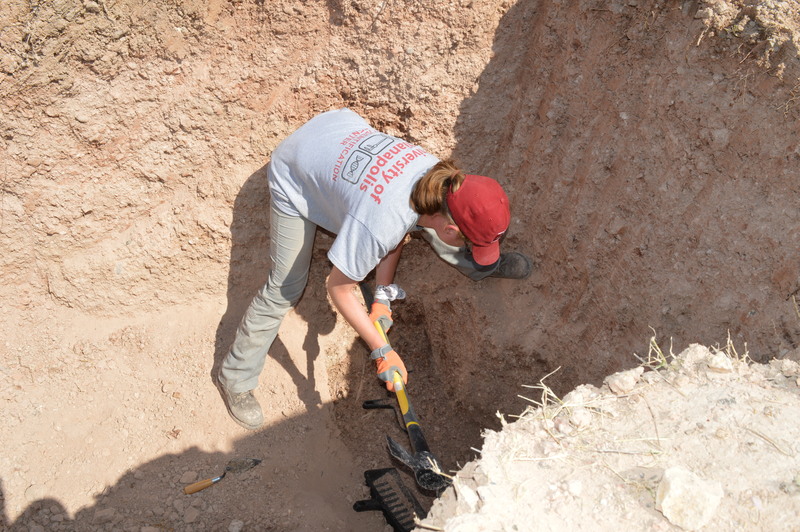 While in Texas, the UIndy team worked at ORPL, the Osteology, Research and Processing Lab at Texas State University to analyze the remains of 9 individuals who were recovered by the UIndy team in January. We also traveled to Rio Grande City, where we recovered the remains of 5 individuals from the Rio Grande City County Cemetery. I am distinctly aware that the work we did in Texas does not put an end to the crisis at the border, but I feel so incredibly fortunate to have been a part of the work. It was such an incredible experience and an emotional one indeed. 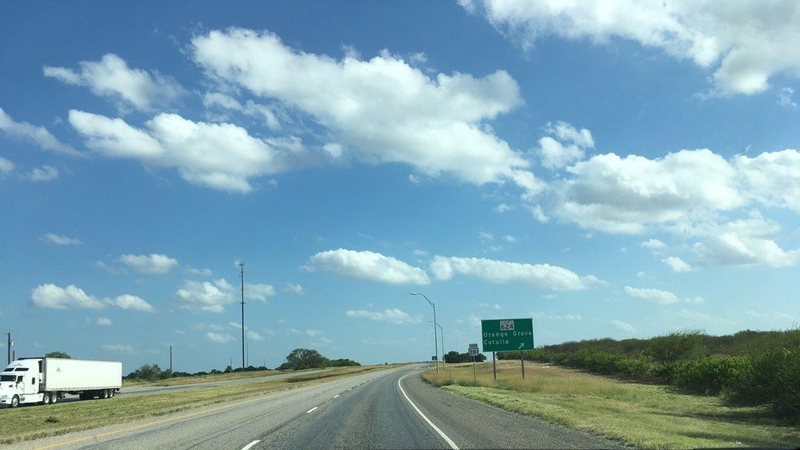 When we drove from San Marcos to Rio Grande City, we drove for roughly 4 hours on a road where we passed 1 or 2 cars our entire trip. On either side of our vehicle were ranches where the brush, cacti and reddish-brown sandy dirt were overwhelming to onlookers. Temperatures ranged from high 90s to low 100s. We passed a border patrol checkpoint, and we saw water stations and paths where tires have been drug by border patrol so they may see any footprints of individuals trying to cross the border from Mexico into the United States. During this road trip, it quickly became apparent why individuals often die when attempting to cross the border. Heat exhaustion sets in quickly and individuals often do not have a clear idea of how long it will take them to cross from Mexico into the United States. When we were working in the field on our last day in Rio Grande City, it was a heat index of 117 degrees Fahrenheit. We each worked for 2 minutes mattocking and shoveling, and then we each took an 8 minute break. To some this will sound absurd. However, I can assure you that there was no way we could have worked for more than 2 minutes at these tasks without quickly finding ourselves in an emergency room at the nearest hospital. We each drank incredible amounts of water to keep ourselves hydrated. 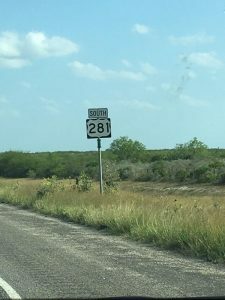 Our experience working in the field at the Rio Grande City County Cemetery and driving to Rio Grande City was an incredibly eye opening experience. On our drive to Rio Grande City, I looked out the window from the back seat of an air conditioned van and my heart was heavy for individuals trying to cross into North America. The journey seems terrifying from an onlooker perspective. I feel so incredibly fortunate to have been able to be a part of this work. Growing up in Michigan, I was not exposed to any happenings at the border. This trip has grown my awareness tremendously. I really enjoyed being able to tour the Texas State University facilities and getting to meet the graduate students and some of the faculty of the university. Overall, this trip has had an incredible impact on me personally. There isn’t a day that goes by now that I don’t think of those individuals who are lost or trying to cross the border. I hope this work will continue for years to come to identify individuals lost in this crisis.